Mother’s Day (May 8, 2016) is right around the corner! It is that one day of the year to make moms feel extra special – a time to honor and thank them. For the best, it’s only right to give the best. Remo Software is honored to announce giveaways to awesome moms on this Mother’s day. Why are they the best? I would like to highlight the daily routine of many women all over the world with a recent Facebook post, which started a virtual uproar on Facebook – “A tribute to stay-at-home moms” by Ryshell Castleberry, a tattoo artist who lives in Florida. 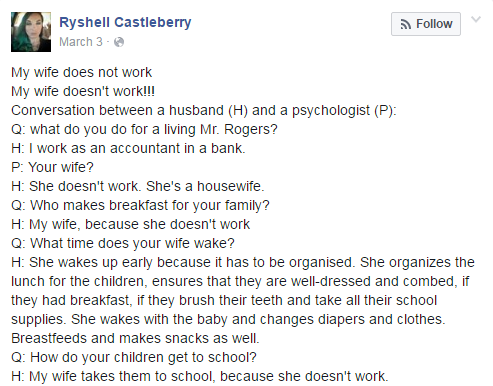 The post starts with a conversation between a man and a psychologist, discussing the things which his wife does all day. That includes change diapers and clothes, breastfeed, make snacks, take the kids to school, going to the supermarket, breastfeed again, make dinner, washing dishes, and help the kids to complete their homework, so on. The post has been shared more than 197,000 times, but Castleberry’s message is not supported by everyone. One mother named Gina Welker Palmateer wrote in comments, “It’s also the daily routine of working women. They just have 8 hours a day less to do it all.” Another mom named Melissa Phelps commented, “I’m a mom who works full time and I’m in college and I still do all this stuff. Working moms do this too”. With teenage kids, it’s only going to be harder for mothers. A new study has confirmed half of the teenagers in the US are addicted to smart devices. The reports also say most of them check their devices at least every hour. 59 percent of parents agreed with the study – their children between ages of 12 and 18 are saying they cannot give up their phones. The study was based on a poll of 1,240 parents and children by Common Sense Media. If you are a mother – by blood, affinity, circumstance or choice, we honor you. You are our everyday hero. You are more important than you realize. Remo software wants to support you with your life. That’s why we came up with the concept of Remo More. It straightly addresses the challenges that you are facing like teenage kid’s addiction to smart devices. Remo More software was launched at Consumer Electronic Show (CES) Las Vegas 2014 and followed by Mobile World Congress (MWC) Barcelona 2014. This award winning app empowers you to have better control over your kids. How Remo MORE Helps Mothers? Remo MORE application can help you to control, monitor and manage your kid’s devices. Track your kids with their device – You can see your kid’s real time location remotely, wherever they are. Block websites having inappropriate content – Internet can easily expose your children to information that might not be appropriate for them. You can block websites with inappropriate content. Block Apps – You can block the apps which you don’t want your kids to access. You can always unblock them whenever you want. Limit app usage time – If your child spends too much time in social media or any specific app, you can set a time limit to give access to those apps. Breach alerts – If your kids wander somewhere they shouldn’t, like an inappropriate website then you can get notifications on your device in the form of breach alerts. Time and service are the greatest gifts ever to make Mother’s day extra special Remo Software is generously giving away its premium product Remo MORE – an app that empowers mothers to protect kids. The first 100 awesome moms who register will get a one-year subscription of Remo MORE for free, which can be connected up to 5 devices. Get the chance to win this exciting Mother’s day offer by Registering Here. Happy Mother’s Day to all mothers around the world!! We at Remo will keep updating MORE because we know you deserve more. When Dads Are Not Babysitting, They’re Parenting! How IoT affects Helicopter Parenting?